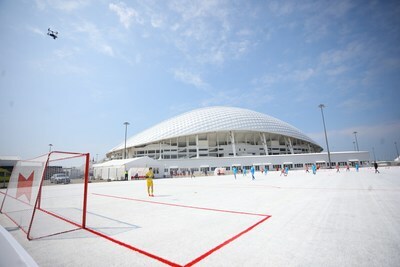 MOSCOW, April 4, 2019 /PRNewswire/ -- Budweiser, an official sponsor of the 2018 FIFA World Cup™, has hit the back of the net by launching a unique football pitch created from its recycled plastic cups in Sochi, Russia. More than 50,000 cups collected at arenas and at the FIFA Fan Fests after the summer tournament have been used to create a new sports facility, the Budweiser ReCup Arena. Over 3.2 million Budweiser Red Light Cups were used during the recent FIFA World Cup™, many of which fans took home as souvenirs. 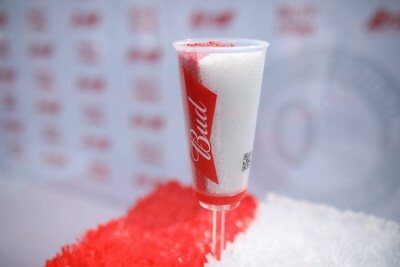 Together with the 2018 FIFA World Cup™ Local Organising Committee, Budweiser collected and recycled the Red Light Cups that were disposed and used 50,000 of these cups to create an innovative, wear-resistant coloured coating for a new pitch measuring 65 x 42 metres that is sure to play host to many tense penalty shootouts in the future. Local football fans will soon be invited to the first ever match on the striking red and white pitch – The World Cup REplay. The event furthers Budweiser's commitment to sustainability, with the brand recently pledging that every single bottle of beer it brews will be powered with renewable electricity by 2025. 100% Renewable Electricity symbols are being added to Budweiser packaging in markets such as the US and UK, where this has already been achieved. Budweiser has been the official beer sponsor of the FIFA World Cup™ for more than 30 years and last year engaged with 3.2 billion football fans globally. 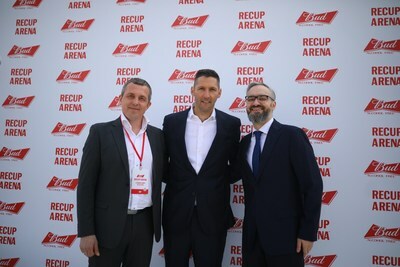 Today, the opening of the Budweiser ReCup Arena in Sochi, Russia, was attended by official guests including Marco Materazzi, FIFA Legend, Andrei Markov, Minister of sports of Krasnodar region and Konstantin Tamirov, Marketing Director of AB InBev Efes. "The 2018 FIFA World Cup in Russia™ has been recognized as the best FIFA World Cup™ ever. For a month, millions of tourists from all over the world were united by the real football celebration atmosphere. I am very glad that BUD, an official sponsor of the tournament, shares the idea of preserving the legacy of the FIFA World Cup™ and continues to build it up even after the tournament," said Marco Materazzi, FIFA Legend and FIFA World Cup Champion. "The FIFA World Cup™ is a celebration for millions of fans not only in Russia, but around the world. Throughout the tournament, Budweiser surprised fans with its activations, gave them euphoric emotions, so we decided to create a unique facility – Budweiser ReCup Arena – specifically to extend this experience. Hopefully, this pitch will remind us of the past tournament and, probably, will help someone start a promising football career," said Konstantin Tamirov, Marketing Director of AB InBev Efes. To find out more about Budweiser's sustainability goals, visit ab-inbev.com.